Illuminations from the attic: Meet Earl: the rugged tablet every outdoors enthusiast should own. 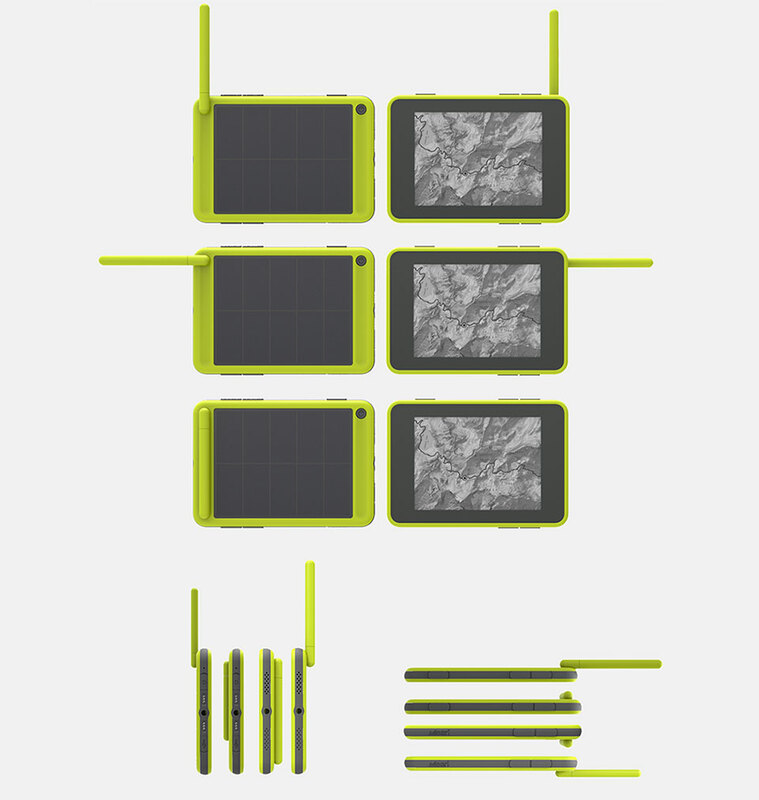 Meet Earl: the rugged tablet every outdoors enthusiast should own. Update: Earl has experienced significant delays, don't expect it to be released until mid 2015 at the earliest. Rewind time by two years and you will find me doodling out my idea of the perfect tablet. Those who follow my blog will know that I am an avid hiker who is not unfamiliar with rain drenched winter trips and precipitous off-trail treks. My perfect tablet would have to be able to be water proof, temperature resistant, and able to withstand the rigors of trekking through rough terrain. It would need a solar panel to stay juiced on long backpacking trips, and an E-Ink screen to preserve battery life and provide greater readability in bright sunlight. It would need a GPS, and a variety of sensors to help gauge changing mountain weather. This was all just idle day dreaming; though I could easily have assembled most of the parts into a working android device, I lacked the skills and resources to build a case, and to program the necessary functions into the completed device. I am also blessed with an extraordinarily short attention span, so the tablet doodle was soon joined by a futuristic car doodle and a doodle for a combination back pack - jet pack! Travel forward in time by a year and a half, and you will find me just signing up for Twitter. I tweet a few hesitant messages promoting my newly created blog, and then out of curiosity peruse my twitter feed. After sorting through piles of dumb spam, I finally come upon a tweet right out of an old techy day dream: meet Earl, the world's first true survival tablet. The Earl's roots lie in a similar daydream to my own; Jon (the lead creator of the Earl) was fed up with having to use many devices to do a few simple tasks, and like me, came to the conclusion that they should logically be combined into one revolutionary device. Unlike me, he didn't let the dream fade; he co-founded the company Sqigle and begun an epic crowd-funding campaign to kickstart the Earl. The campaign was a stunning success, and raised over $600,000-twice the amount necessary to build the Earl. To those readers gazing in utter incomprehension at this wall of arcane text, I will reduce to it to a more digestible form: Earl is fully shock proof, dust proof and water proof. It has a powerful radio and GPS system capable of working in just about any country on the planet. It is equipped with a rugged solar panel which can not only recharge the Earl's own battery (which can hold enough charge to function for 20 hours without recharge), but can also charge your phone or camera. It has Wi-fi and near-field communication capability, as well as Bluetooth (although it does not have cellular capability). It is even capable of predicting the weather via a built in thermometer, humidity censor and barometer (an anemometer will be available for purchase separately to further increase its accuracy in weather prediction). I even have high hopes for the Earl's speaker system; could this be the first tablet to actually make music sound good? The Earl's only possible weak point is it's somewhat slow processor/RAM combo. However, you won't be watching movies or playing graphically intensive games on this device, so I don't expect this slight lack of processing power will be noticeable. It might, in fact, be to some advantage due the battery saving nature of the less powerful hardware. So now the questions you are undoubtedly asking is "when can I buy this thing?" and "will I have to mortgage my house to afford it?". The answer to the second question is a definite no. If you preorder the Earl it will only cost you $300 (or $350 if you opt for the 24k topo map package (the standard version only comes with 100k maps)). That price will rise after the Earl releases, but expect it to stay under $400. The answer to the first question is somewhat harder to answer. The Earl has already been delayed many times since it was funded (it was originally supposed to release before summer in 2013). It is now nearing completion, but issues with designing and getting FCC approval for the radio have pushed the projected release date back to this summer. My optimistic estimate is late June, but it could easily be August (or even later than that!) before the Earl is available. One thing is for sure: it will be worth the wait for this incredible device, and I am looking forward to meeting my Earl in person! UPDATE: Earl has been delayed into fall 2014. UPDATE 2: Earl's website has been pretty much dead for several months now with no news whatsoever from the Earl team. I wouldn't expect the Earl to appear any time before this summer, if at all. Really, really interesting, Andy! Did I miss an estimate of weight somewhere in the specs? Thanks! The Earl website says that it weighs 14 ounces, but I'm not sure how current that information is.